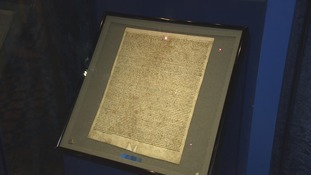 A 45-year-old man has been arrested on suspicion of attempted theft of the Magna Carta. Wiltshire Police said they were called shortly before 5pm on Thursday after alarms were activated at Salisbury Cathedral. The glassed box surrounding the original 1215 Magna Carta had been smashed. A man, matching the description given by witnesses, was arrested on suspicion of attempted theft, possession of an offensive weapon and criminal damage. He was taken into custody for questioning where he remains. Police says they're aware that there were a number of witnesses to the incident who may not have spoken to them. If you have any information, contact police on 101 and quote crime reference number 541800101438.